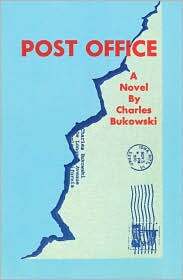 If you have ever taken the majority of your dinners with an employee of the United States Postal Service, you will learn that Charles Bukowski’s novel Post Office is what these people use instead of a mirror. This has long been a favorite book of my boyfriend, and one he has suggested I read for an accurate look at how he spends his business hours. Finally, fueled by back-to-back viewings of the movie Factotum, and the documentary “Born into It,” I had built up some juice for more of a Bukowski binge. The curmudgeonly drunk and dirty old man doesn’t just appeal to government workers, after all. Like anyone who has ever been a 20-something who enjoys scrambling word combinations and giving mouth-to-mouth to a bottle of whatever, I, too, have found an occasional Bukowski-ism that resonates. Until now, I’ve only read his poetry ? which I love for its stark and frank narrative qualities and for the seedy portraits of old-school Hollywood gutter life. In non-rhyming verse. After four years with an anecdotal USPS tutorial, I found the trip into the thinly-veiled Bukowski character Henry Chinaski’s life pretty seamless. For the brunt of the book, he is negotiating the aches and pains ? both physical and mental ? of various positions at the post office. He starts as a mail carrier, and is propositioned by a woman his first day on the job ? which he mistakenly believes characterizes life as a mailman. Later on he becomes a clerk, working off-hours (a scenario that is very near and dear to my own heart). There is an on-going battle against supervisors, whom he refers to as “soups,” about length of breaks, and tardiness and rule book infractions. In one scene, a supervisor reprimands him for tossing his cap on top of a machine. The supervisor feverishly typing up warnings, handing them to Chinaski who tosses the slip in the garbage can. The supervisor rushes off to write him up for that, and Chinaski again chucks the warning. This goes on and on until Chinaski tells the supervisor that one of them looks pretty stupid. During his down time he indiscriminately ruts with women, some who stick around longer than others, plays the ponies (sometimes successfully enough to make phat cash), and drinks. Oh, lo, how he drinks. On a particularly hot day as a mail carrier, Chinaski has booze seeping out of his pores. He gets in scrapes with jilted boyfriends. He gets married to a wealthy woman. He visits and revisits his old girlfriend Betty, a down-and-outter who eventually dies, leaving behind a pool of blood in her bed. I love Bukowski’s work, probably an unpopular opinion among women, and by publicly admitting it, I’ll probably never be able to march in a NOW parade. But I think he really opened up the definition of poetry to something modern and accessible, and he has such a uniqueness of voice and subject matter and realism. (Of course, today this voice some young men ? “serious writers”– adopt like a fake Southern accent when they begin making words, so maybe we should rue the day Bukowski first got published). I like Bukowski, too, so you’re not the only female. I’ve only read his poetry, though, and for some reason I can’t quite articulate, it captivates me. Maybe because he was like a rock star when he’d give poetry readings, downing beer after beer and smoking non-stop, while around him his adoring fans cheered? It’s kind of cool that a poetry reading sounds like a rock concert. I’ll have to check out this book and some of his short story collections now.